Life is funny sometimes in the way it can choose a path for you. So my first impulse was to look back on one of my earliest DC favorites, and since I just mentioned him in my Vision post, Captain Comet sprung to mind. Then I started pulling my back issues of Secret Society of Super Villains and figured maybe I’d make a post about the SSOSV instead; or maybe a two-part post covering both. Then I start pulling back issues of Justice League of America for further research when suddenly it leaps out at me: It’s summertime right now, my favorite season. And one of my fondest summer memories is the Justice League/Justice Society team-ups that used to be published every summer of my childhood. It was fate. In this post, I simply had to look back on those classic JLA/JSA team-ups that I grew up with and loved so dearly. For all of the uninitiated out there: The Justice Society of America was the first “all-star” team of superheroes, making their debut (appropriately enough) in All-Star Comics #3 (Dec. 1940). Original versions of the heroes Flash, Green Lantern, Hawkman, and the Atom were all regular members at one time or another. Their final adventure took place in All-Star Comics #57 (March 1951), after which the title became All-Star Western. The superhero craze in comics was largely over—for a brief period of time, anyway. In Showcase #4 (Oct. 1956), a new version of the Flash appeared. The character proved so popular that similar revivals of Green Lantern, Hawkman, and the Atom soon followed. 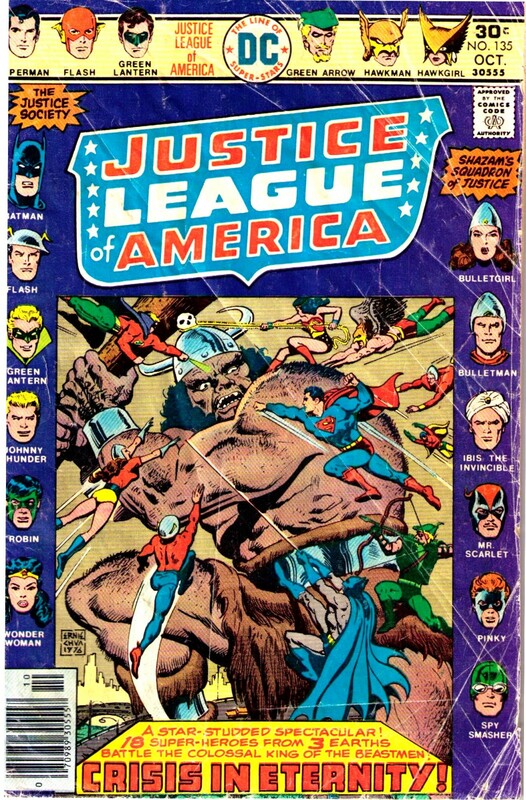 Inevitably, these new characters (along with standbys Superman, Batman, and Wonder Woman, all of whom had been published continuously since their debuts) formed a new all-star team of heroes called the Justice LEAGUE of America, which first appeared in the pages of The Brave and the Bold #28 (March 1960). Before long, old-time fans began writing in, wanting to know the fates of the previous versions of the Flash, Green Lantern, et al. These queries were answered with the story, “Flash of Two Worlds!” which was published in The Flash #123 (Sept. 1961). This tale featured the first meeting of the two Flashes, revealing that the original Flash existed on a parallel world; one that would be called Earth-2. Again, the story was so well received that the original, Earth-2 Flash (or as he’s more commonly referred to, the Golden Age Flash) would return for another guest shot just six issues later in The Flash #129 (June 1962). Eight issues (and one calendar year) after that, the Golden Age Flash returned yet again in Flash #137 (June 1963)—and this time he brought the Justice Society of America along with him. 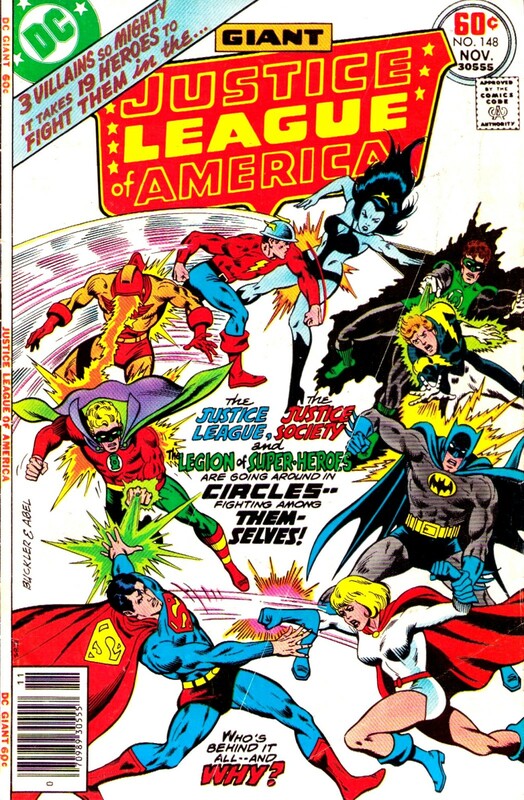 Just two months later, the two teams—the Justice League of America and the Justice Society of America—would meet for the first time in the pages of JLA #21. Whether they originally planned it this way or not, it would become an annual, summer tradition for the JLA & JSA to get together in the Justice League comic for the next twenty-two years! I should note that these JLA-JSA get-togethers were sometimes referred to as “crossovers” back in the day, which was/is kind of a misnomer, as more often than not the JSA had no title of its own to “crossover” into. And even when it did, the action was still usually restricted to the pages of the JLA title only. To follow is a list of the first thirteen JLA-JSA team-ups, all of which took place before my time as a comics nut. Note that cover dates, as per usual, were postdated two to three months beyond the actual on-sale date, so I put the cover dates in parentheses and the on-sale dates in brackets. On-sale dates courtesy of Mike’s Amazing World of Comics database (www.dcindexes.com). For the first nine years, there was a remarkable consistency to the team-ups. As noted above, they were always two-part stories published across two separate issues, always released in June and July, and always with the exact same cover dates (August & September). In the 1965 storyline, the only JLAer to get a proper appearance in part one (issue #37) is the Flash, and it’s basically a cameo. In part two, we see the JLA in one panel on the last page—again, it’s basically a cameo. These two issues are pretty much carried entirely by the JSA. In the 1968 storyline, no JLAer appeared in any form whatsoever in part one of the story (issue #64). 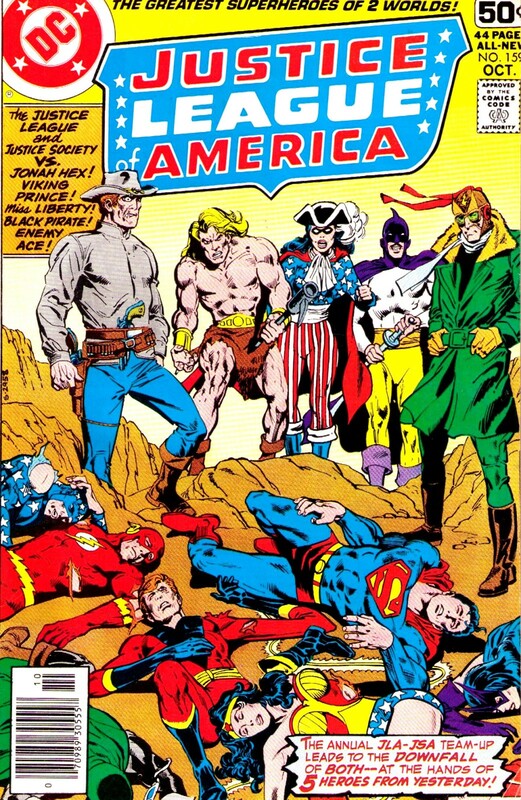 I’m pretty sure this was the only time in history that an issue of Justice League of America did not feature an appearance from any member of the team. The first three-parter was in 1972, taking place across issues 100-102. As luck would have it, the team-up coincided with the JLA’s 100th anniversary issue that year. Hooray for an extra issue of team-up goodness! YAY! 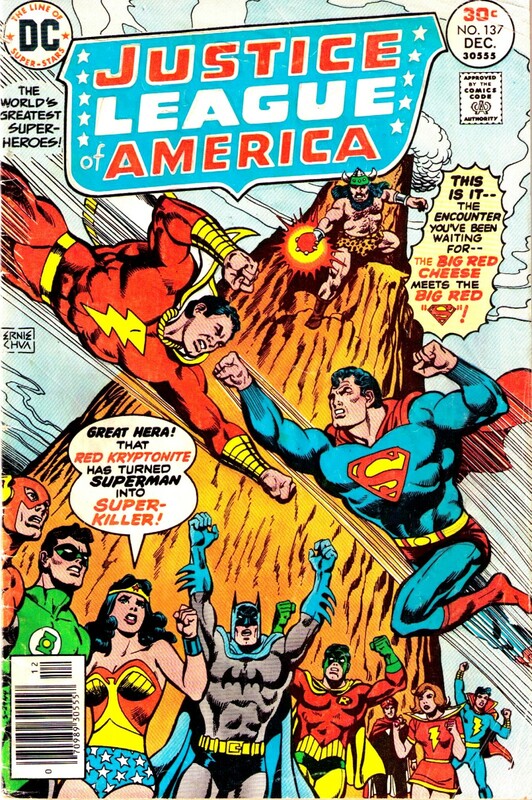 The one and only time that the team-up was confined to a one-issue story was in 1974, in issue #113. Boooooo! Alternate Earths explored (apart from Earth-1 and Earth-2, homes of the JLA and JSA, respectively): Earth-3 (1964), Earth-A (1965), Earth-X (1973), Earth-Prime (1975, 1982), and Earth-S (1976). There were only two times that any part of the team-up story took place outside the pages of the Justice League title. The first was in 1982 when the story crossed over into the pages of All-Star Squadron. In the Justice League animated series, the two-parter “Legends” was largely an adaptation of/homage to that first JLA-JSA team-up in JLA #21-22. 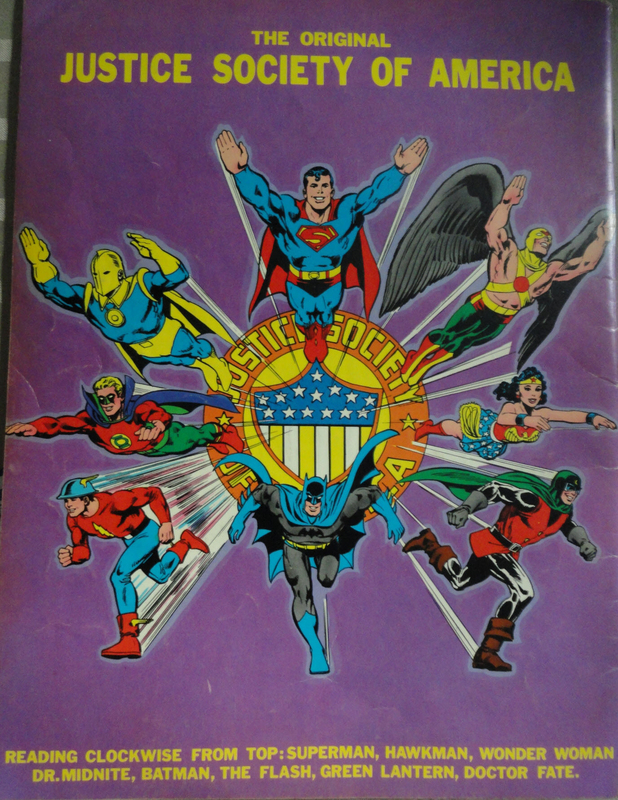 As mentioned way back when, my comics fandom really did not begin in earnest until the spring of 1976. So the JLA-JSA team-up tradition was in it’s fourteenth(!) installment by the time I got aboard in the summer of that year. Looking back, it feels like I knew the Justice League well before I knew anything of the Justice Society—but this is only because of my exposure to the Super Friends TV show. In strictly comic-book terms, I believe I may have actually encountered the JSA first! 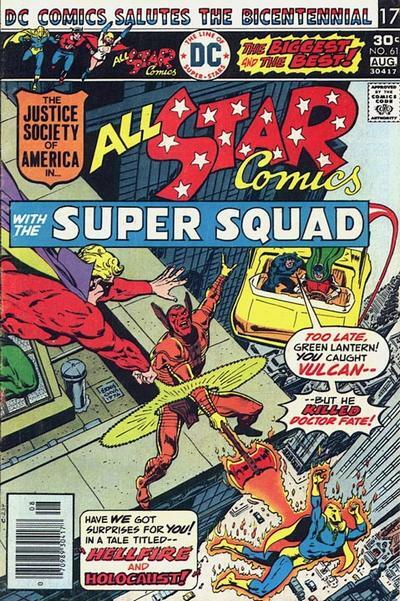 One of the earliest comics I remember buying off the racks for myself in the spring of ’76 was All-Star Comics #61. (An especially memorable issue because this is where the “Death of Doctor Fate” storyline got its start.) 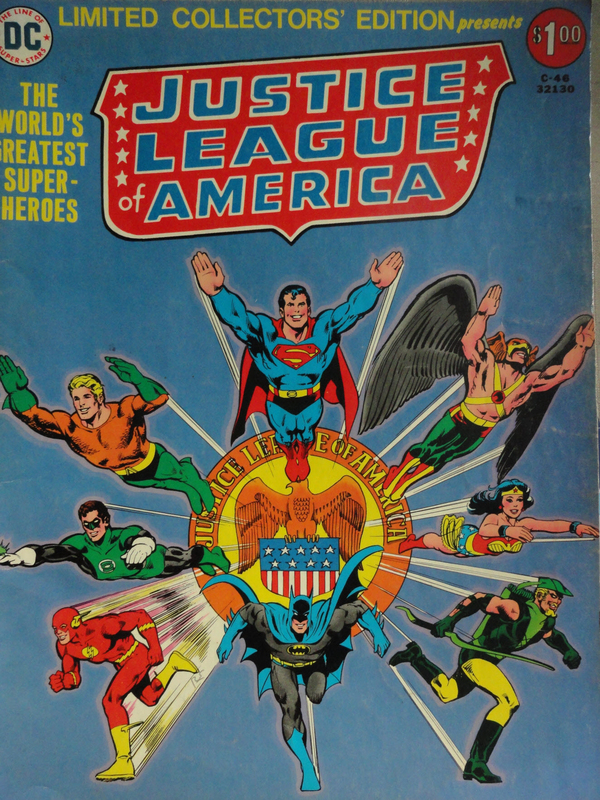 I am also absolutely certain that the first issue of Justice League I ever bought was #133. All-Star Comics #61 had a cover date of July/Aug. 1976 and an on-sale date of April 15, 1976. 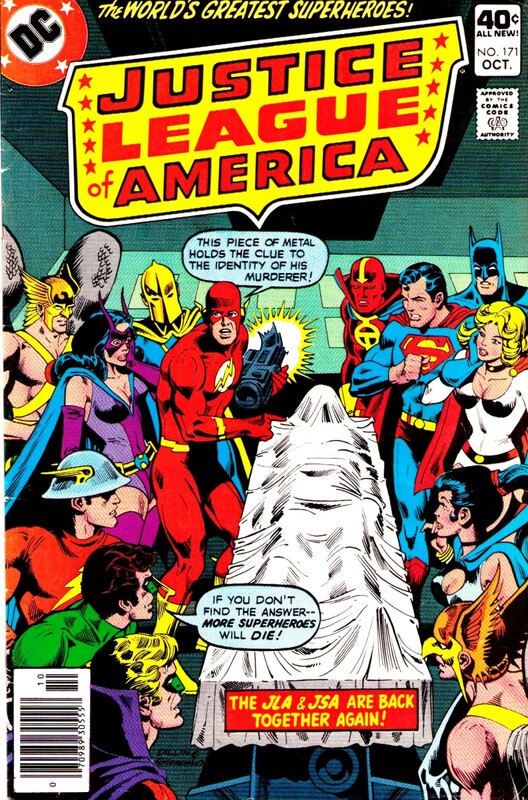 Justice League of America #133 had a cover date of Aug. 1976 and an on-sale date of May 17, 1976. Now comics distribution was not an exact science back then, and I suppose it’s possible that All-Star #61 might have lingered on the racks a bit and I wound up buying JLA #133 first despite All-Star getting released earlier… possible, but unlikely. This probably should have left me a bit confused, with different, older versions of certain characters taking center stage in All-Star, but I don’t remember this being the case. Or if it ever was the case, I’m guessing I caught on rather quickly. So we’ve got eight characters from each team shown. Superman and Batman are damn near the same; Hawkman and Wonder Woman are slightly different; Flash and Green Lantern are very different; and two of the characters are completely unique (we speak of the JLA’s Aquaman & Green Arrow and the JSA’s Doctor Fate & Dr. Mid-Nite). This spells out the basic differences between the two teams rather neatly. 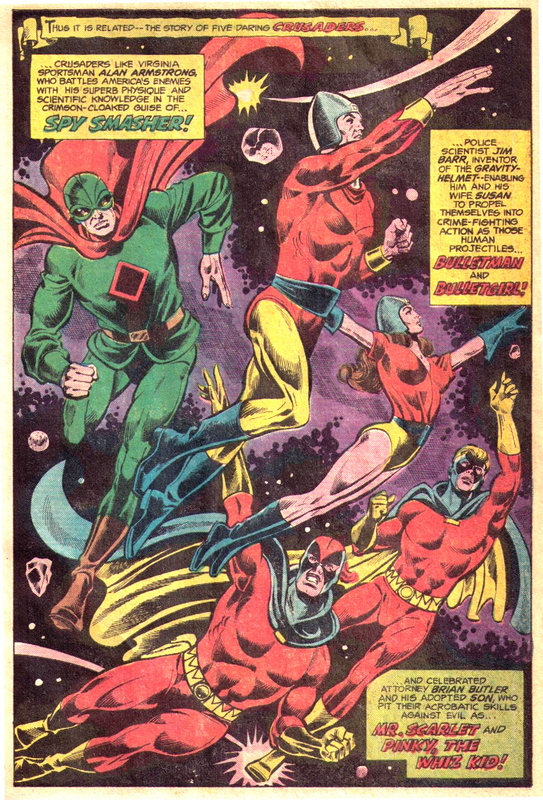 Sidebar: It just hit me that the first superhero team comic I ever bought and/or owned was the Legion of Super-Heroes! (Specifically Superboy and the Legion of Super-Heroes #204, cover date Oct. 1974, as noted in my old “odyssey” blogpost.) That’s a pretty complex team/title to get started with! Cover scan of my own beat-to-hell copy of JLA#135, first purchased off the racks by me for three dimes nearly forty years ago. I loved everything I saw here, particularly the wide range of colors in the costumes; the esoteric names of “Mr. Scarlet” and “Spy Smasher”; and those bullet-shaped helmets on Bulletman and Bulletgirl, which struck me as totally boss. Throw in Ibis the Invincible (not pictured), and you’ve got six new (to me, that is) superheroes! But that’s not all—we also got a bunch of new/old supervillains! First and foremost there was the primary antagonist of the story, King Kull. Other classic Fawcett bad guys featured in the storyline were Ibac, the Weeper, and Mr. Atom. In addition, we had a couple of Golden Age foes of the JSA, Queen Clea and the Shade, to go along with more well-known villains the Joker, Penguin, Brainiac, Dr. Light, and Blockbuster. …Whew! That’s one heck of a smorgasbord of super-characters to squeeze into just three issues! Now this fight turned out to be anticlimactic (we’d have to wait until the 1978 Superman vs. Shazam! tabloid-sized release for a more proper battle between the two), but damn, it sure does make a sweet cover, huh? Another solid entry here, with the awesome Mordru playing the heavy in part one, and the Demons Three taking over in part two. The addition of the Legion (with their infamously overstuffed roster) made for another great free for all. And at this point I was more than a year into my fandom, so I knew all the characters rather well. We’re back on track with this one—in fact these next three years are the height of the tradition, in my opinion. It’s a murder mystery aboard the JLA satellite, which proves a rather refreshing change of pace. It was also my introduction to Mr. Terrific, who (spoiler alert) winds up the murder victim. So naturally I fell in love with the character and would hunt down his previous appearances in old team-up issues of JLA in the back-issue bins of flea markets all across the state of New Jersey. Another interesting point about this particular storyline: Although they uncover the identity of the real killer, he actually gets away. The story makes a point of the moral victory that is achieved by the group of comrades not turning on each other and never losing faith in each other over the course of their investigation—stressing that this was what was most important. And again, this was a refreshing break from comic book formula. Still, I would have liked to see them catch the killer; if not here, then at some point shortly thereafter! Well they finally got around to this EIGHTEEN YEARS LATER, in the pages of The Spectre #54 (June 1997). If you’re just getting started in fandom, all you have to do is track down this issue and you can see justice done—you won’t have to wait nearly two decades like me (and so many others). Click below to continue to page 2! Previous PostBlind Byrne WorshipNext PostFlash of Brilliance? Not to be too picky, but that should be Spectre v3 # 54. I guess that set a new record for longest time for a story resolution, after the Hobgoblin’s identity in Spider-Man, which took 14 years to resolve properly!